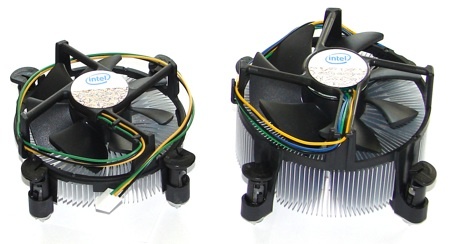 Some heatsink manufacturers will undoubtedly launch designs that have sliding mounts that can accommodate both LGA1156 and LGA1366 motherboards, but in the meantime we have to preview our Core i7 870 using a standard Intel cooler that looks a bit weedy. Although the stock cooler appeared to do a decent job during testing, we got the impression that it had an impact on our overclocking efforts and we look forward to using a chunky aftermarket cooler in the future. A CPU isn’t much use on its own, so we rounded up an early sample of a Gigabyte GA-P55M-UD4 motherboard. 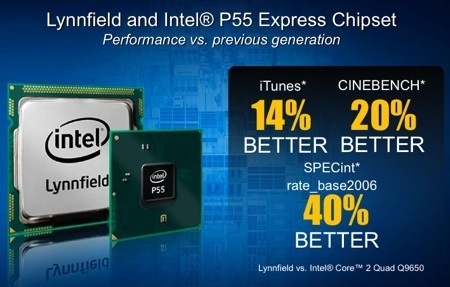 At present, Lynnfield is only paired with the P55 chipset, which is a single chip that is the equivalent of the historic southbridge - aka MCH - that manages USB, Sata, HD audio and Ethernet. The GA-P55M-UD4 is a compact Micro-ATX motherboard that manages to offer two graphics slots despite its small size. We rapidly found that it isn’t a finished production item - the integrated Gigabit Ethernet doesn’t work and the mobo comes with 6Gb/s Sata ports that won’t make it to the production model. When it came to sourcing DDR 3 memory we had no such trouble as Lynnfield uses the same low-voltage memory as the Core i7 900 except that you use two modules instead of three - or four instead of six. The Computex slide refers to Lynnfield but doesn’t make it clear whether we are talking about Core i5 or Core i7 800. If we assume that Intel compared like-with-like and so used a 2.93GHz Lynnfield, ie. the Core i7 870. Happily, we had a Core i7 870 and we also have a 3.0GHz Core 2 QX9650. Add in a Core i7 940 with a clock speed of 2.93GHz and that’s three quad-core CPUs with similar clock speeds that represent LGA775, LGA1156 and LGA1366. Game on.